Sprayers are available in most garden centres and DIY chains, and make it much easier to apply weedkillers, insecticides and other sprays to a large area than using ready-to-use packs with nozzles. Using a sprayer. Credit: RHS/John Trenholm. Sprayers are suitable for applying many garden chemicals such as fungicides, insecticides, herbicides, weedkillers, algae and mosskillers. They come in many sizes, from small 500ml hand-held misters to large 16 litre knapsacks. The large sprayers are particularly good for applying weedkillers to big areas. 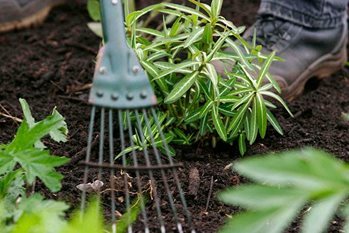 Ready-to-use chemicals are very popular with gardeners and there are a wide range of products available in many sizes from all sorts of retailers. The advantages of ready-to-use products is that they are easy to use and are ready to go whenever you need them; there's no need to make up a solution. The disadvantage is the cost. It is far cheaper to make up a 3 litre (¾ gallon) solution of weedkiller from a concentrate than to buy the equivalent as a ready-to-use product. But, if you never use this much at one time, the ready-to-use option is the best one. Remember to use separate sprayers for weedkillers, and for other purposes – if not, cross-contamination could be a problem unless scrupulous washing between materials is carried out. Check that the sprayer is functioning correctly by filling with water and testing it, before using the sprayer to apply pesticides. You will need to obtain your chosen garden chemical as a concentrate for dilution inside the sprayer. Concentrates come in liquid or solid form, solids being either powders, crystals or granules. Liquid concentrates usually have a measuring cup in the lid, but solids may need to be weighed out with an old set of household scales set aside for this purpose. Some solids come in convenient sachet packs, one sachet being the correct amount for dilution in a specified volume of water (usually 4 litres/1 gallon). Correct angle: Keep the nozzle pointing downwards, and keep it quite close to ground level, to avoid spray drifting onto unwanted areas. The spray pattern widens with distance from the nozzle. Spray quality and width: For most home garden sprayers this can be adjusted by twisting the terminal nozzle to select a suitable droplet size and width of overall spray pattern. Coarse spray: This is less likely to drift onto nearby plants, and while a wide spray pattern allows quick coverage of a large area, a narrow spray pattern allows safer spraying in small areas. Blockages: Using a coarse spray for a few seconds can dislodge accumulated residues that may be blocking the nozzle. Blockages usually become evident by a coarsening or dribbling of spray. The screw on the handle allows ‘bleeding’ of the system above the terminal nozzle. This may be useful for shifting residues that may be blocking the lance or valve above the terminal nozzle. Avoid very hot, sunny days, as plants are less active and therefore less efficient at absorbing the chemical. Leaf scorch can be problematic when spraying any chemicals in the heat of the day, and the chemical solution may evaporate, giving off fumes that are potentially harmful to other plants. Dry, overcast days are ideal for spraying.